The 2018 midterm elections were perhaps the most intensely covered midterms ever. Two broadcast networks introduced new theme music to brand their many hours of live coverage. 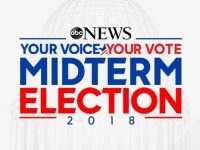 ABC News debuted a completely new election theme by DreamArtists Music. It’s big, bold, urgent and orchestral. NBC News debuted a new variation of their classic election theme by Michael Karp. They were used in addition to the main theme that was used in previous elections. The new variation extends the life of the theme that has been used by NBC in one way or another since 2004.